To Cite: Roy S, Bandyopadhyay S K. Computerized Detection of Normal and Abnormal Tissues from Brain MRI, Arch Neurosci. Online ahead of Print ; In Press(In Press):e84581. doi: 10.5812/ans.84581. The proposed method is a multi-scale algorithm for brain tissue segmentation that produces acceptable results compared to the existing methods. It can detect the abnormality in the brain lesion if any. A level set-based minimization scheme is used for the segmentation model using iterative concepts and changing the speed function of the level set. This is while the popular level set frameworks have so far only been used for two-region segmentation or segmentation with a fixed number of regions. Moreover, maintaining a hierarchical structure based on sharp peaks provides good initializations. The method is less sensitive to local minima and maxima than comparable methods. The performance comparison of the proposed model and the existing well-known methods shows that the proposed method gives more accurate and stable results for transverse, coronal, and sagittal MR images. The proposed method removes over and under-segmentation problems and improves segmentation accuracy compared to other gold standard and recent methods. This paper deals with the segmentation of normal and detection of abnormal tissues in MRI of the brain. Normal tissues and abnormal tissues in MR images are detected by the proposed model. Central nervous system (CNS) consists of gray matter (GM), containing neuronal cells, and white matter (WM), containing myelinated axon tracts. The nervous system can be damaged by various diseases such as multiple sclerosis. Segmentation approaches for brain tissue analysis have been followed by various researchers. A method based on supervised decision forest for the segmentation of brain tissues could bear good results (1). A heuristic-based Bayesian method (2) was used for segmenting brain MR images based on expert knowledge. An automatic segmentation method is desirable because it reduces the workload of human experts and generates fully reproducible segmentations. A computer program also has the advantage of being able to process a large amount of information typically presented within MR images in a more consistent manner compared to human raters. 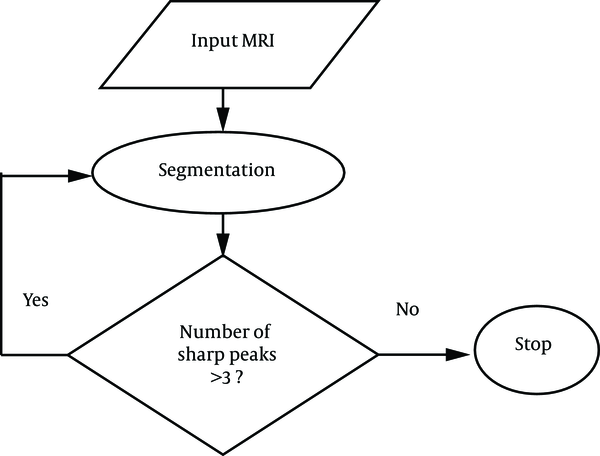 In this paper, a method is proposed for the detection and analysis of normal and abnormal tissues from brain magnetic resonance imaging (MRI). The automatic segmentation of the stroke, hemorrhage, multiple sclerosis, and tumor lesions from brain MR images facilitates accurate, fast, and reliable computer-based diagnosis of brain diseases. Abnormalities detection and tissues quantification in a brain MR image are very important for segmentation and identification of diseases. The proposed iterative level set methodology based on sharp peaks of greater than three and generating hierarchical structures is able to correct segment and differentiate between normal and abnormal brain tissues. The proposed normal tissue detection technique gives very good results compared to other well-known gold standards including K-means, FCM, and level set methods. The method identifies accurate segmentation of brain tissues and finds possible abnormalities in MR images. The average values of RE are less than 5%, KI is greater than 95%, JI is greater than 95%, CD is greater than 95%, and FD is less than 5%, indicating the goodness of the method. The experimental results showed the accuracy and efficiency of the proposed technique in tissue segmentation. These correct quantifications of major normal tissues, such as WM, GM, and CSF, and non-brain regions of the human head help diagnose diseases by measuring major tissues. The result of the proposed method is compared with a reference image and other comparable methods such as K-means, FCM, morphology, and Atlas methods. The average value of performance metric RE is 3.27129%, KI is 96.8358%, JI is 93.9496%, CDR is 97.4231%, and FDR is 3.78505%, which indicate the high accuracy of the proposed automatic segmentation method. An integrated method over the entire domain and incorporated into a variation level set formulation was developed by energy minimization (3). Another method was introduced for image segmentation based on intensity characterization (4). Other concepts of level set-based method on a sparse field produced good results and were admirable in leakage prevention (5). Some researchers used 2D wavelet decomposition features to segment different tissues and differentiate between normal and abnormal tissues (6); however, the method did not work well in different types of the image regarding accuracy. Recently, K-means (7) and FCM (8) based methods have been used to segment the brain tissues, but they did not perform well on different types of brain image regarding accuracy, specificity, and sensitivity. The problem of under and over segmentation still exists in K-means and FCM methods (9). The region growing method requires a seed point; it is manually selected by the user to remove all pixels connected to the preliminary seed under some predefined conditions. These conditions can be based on intensity information or boundaries in the image (6). The traditional FCM clustering algorithm for MR images segmentation may perform very fast and simple, but this algorithm does not guarantee the high accuracy, especially for noisy or abnormal images. Two-level set functions Φ1, Φ2 of the region Ω1, Ω2 to define M1, M2 and M3 give three-region segmentation. The model parameters can be estimated by maximizing the overall likelihood of the observations X coming from the model λ. The maximum likelihood expression is a non-linear function of the parameters λ and therefore, a closed form of solution for direct maximization is not possible. The Gaussian model based on local mean and variance statistics successfully smoothens the initial pixel-wise probabilistic values. It enables the accurate segmentation of low and high contrast brain structures from the surrounding tissues (9, 12). 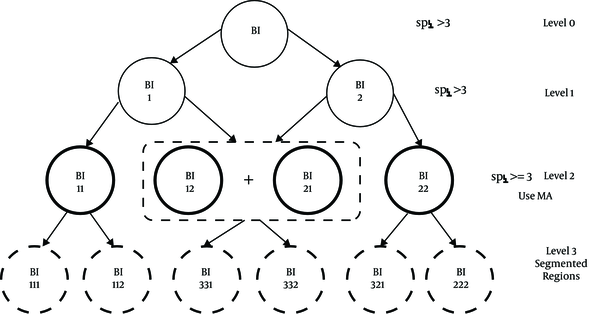 After performing the three-region level set segmentation with three membership functions, three segmented regions were clearly separated. The conceptual block diagram of the iteration of the proposed method is shown in Figure 1. It uses accurate segmentation. npk is divided by three because here only the previous three and next three neighbor positions are considered to calculate the peak values. Depending on the sharp peak value pk, the required repetitions of level set segmentation can be less than or equal to three. At level two, all decomposed fragments have sharp peaks of less than or equal to three. If any abnormality is present in the brain, it does not follow the same structure shown below, and abnormality needs to be decomposed into higher than level three. Therefore, if any abnormality is present, some greater numbers of nodes can have sharp peaks of greater than three at level two. The process of the proposed method to have accurate segmentation is shown in Figure 2 as a hierarchical diagram. Figure 2. The hierarchical diagram of the proposed methodology for normal brain structure; if any abnormality is present, it is detected at level two and the number of sharp peaks of a node at level two will be greater than three. From Figure 2, it is clear that initially, normal brain image (BI) is segmented into two regions. The first region contains WM, GM, marrow, and muscles skin and the second region contains GM, CSF, and muscles skin. The initial MR brain image is denoted as level 0, the next level is denoted as level 1, and so on. If any segmented region at level two has greater than three numbers of sharp peaks, then the presence of an abnormality in the brain is considered. Finally, we segment WM, marrow, GM, muscles skin, CSF, and fats by using the max area from left to right for each parent node. Any abnormality detected at level two is denoted as an abnormal tissue. The proposed method was tested with a couple of MR brain images (13, 14). BrainWeb is a dataset that provides brain MRI for different acquisition modalities and its ground truth segmentations such as T1, T2, and PD (13, 14). The outputs of the different steps of the proposed methodology are shown in Figure 3. Figure 3. 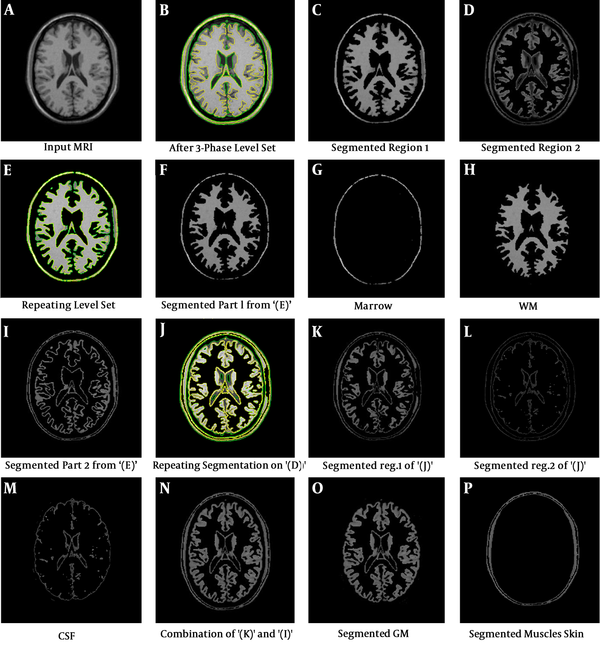 The results of segmented tissues using the proposed method where A, is input MRI; B, after 3-phase level set; C, segmented region 1; D, segmented region 2; E, repeating level set; F, segmented part 1 from ‘(E)’; G, marrow; H, WM; I, segmented part 2 from ‘(E)’; J, repeating segmentation on ‘(d)’; K, segmented reg.1 of ‘(J)’; L, segmented reg.2 of ‘(J)’; M, CSF; N, combination of ‘(K)’ and ‘(I)’; O, segmented GM; P, segmented muscles skin. The histogram of tree structure level 0 is shown in Figure 4. Level 0 histogram means the grayscale of input MR image histogram. As more than three sharp peaks are present in this histogram, the level set segmentation method is required. The histogram of tree structure level 1 is shown in Figure 5. Here, one example of level 1 histogram performed on Figure 3C is shown. As more than three sharp peaks are present in this histogram, the repetition of segmentation is required. The histogram of tree structure level 2 is shown in Figure 6. Here, one example of Level 2 histogram performed on Figure 3F is shown. As the number of sharp peaks is less than or equal to three in this histogram, the repetition of segmentation is not required. Another result with coronal MR image of the proposed methodology with almost a perfect segmentation is shown in Figure 7. Figure 7. The results of coronal MR image of the proposed methodology. 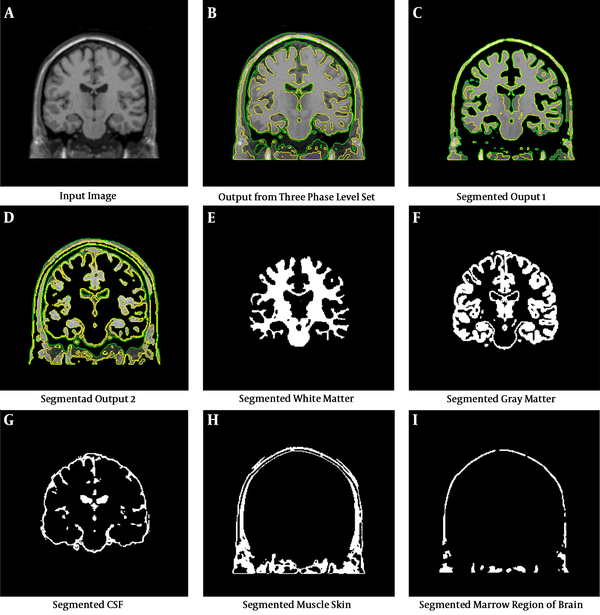 A, input image; B, output from three-phase level set; C, segmented ouput 1; D, segmentad output 2; E, segmented white matter; F, segmented gray matter; G, segmented CSF; H, segmented muscle skin; I, segmented marrow region of the brain. Compared to standard level set (2), K-means (7), and FCM (8) as gold standard methods, the proposed method is more efficient and accurate, especially for a large-scale problem. Segmented results on normal MR images compared to the outputs of other gold standard methods and ground truth are shown in Figure 8. Figure 8. 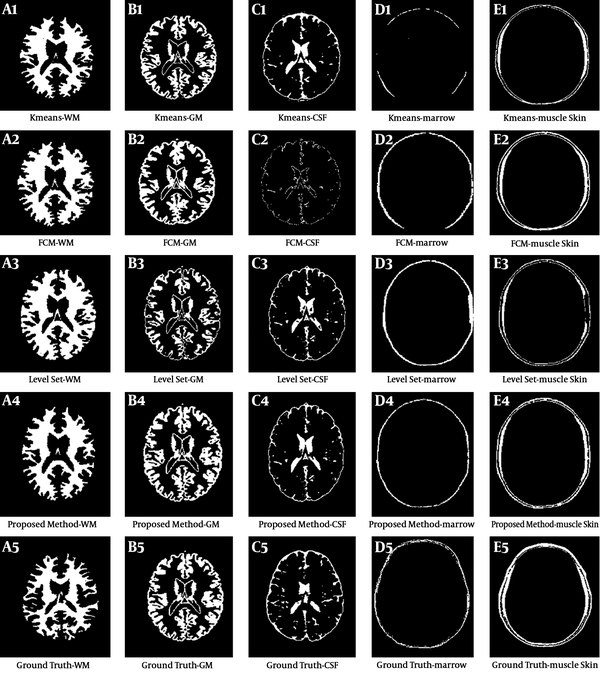 The results of segmentation on the transverse image of Figure 3A inputted MRI; A, B, C, D, and E from left to right indicate WM, GM, CSF, marrow, and MS; 1, 2, 3, 4, and 5 from top to bottom indicate K-means, FCM, level set, the proposed method, and ground truth segmentation. A1, K-means-WM; B1, K-means-GM; C1, K-means-CSF; D1, K-means-marrow; E1, K-means-muscle skin; A2, FCM-WM; B2, FCM-GM; C2, FCM-CSF; D2, FCM-marrow; E2, FCM-muscle skin; A3, level set-WM; B3, level set-GM; C3, level set-CSF; D3, level set-marrow; E3, level set-muscle skin; A4, the proposed method-WM; B4, the proposed method-GM; C4, the proposed method-CSF; D4, the proposed method-marrow; E4, the proposed method-muscle skin; A5, ground truth-WM; B5, ground truth-GM; C5, ground truth-CSF; D5, ground truth-marrow; E5, ground truth-muscle skin. The performance comparison of the proposed model and the existing well-known methods shows that the proposed method gives more accurate and stable results for transverse, coronal, and sagittal MR images. The proposed method removes over and under-segmentation problems and improves segmentation accuracy when compared to other gold standard and recent methods. Authors' Contribution: Samir Kumar Bandyopadhyay: preparing the proposed method; Sudipta Roy: preparing the computer program. Conflict of Interests: The University of Calcutta. Ethical Considerations: All ethical considerations were properly judged by the Ethics Committee of the University of Calcutta. Funding/Support: No funding support was received for the work. 1. Yi Z, Criminisi A, Shotton J, Blake A. Discriminative, semantic segmentation of brain tissue in MR images. International conference on medical image computing and computer-assisted intervention. Berlin: Heidelberg; 2009. p. 558-65. 2. Huang A, Abugharbieh R, Tam R, Alzheimer's Disease Neuroimaging I. A hybrid geometric-statistical deformable model for automated 3-D segmentation in brain MRI. IEEE Trans Biomed Eng. 2009;56(7):1838-48. doi: 10.1109/TBME.2009.2017509. [PubMed: 19336280]. [PubMed Central: PMC3068615]. 3. Li C, Huang R, Ding Z, Gatenby C, Metaxas D, Gore J. A variational level set approach to segmentation and bias correction of images with intensity inhomogeneity. Med Image Comput Comput Assist Interv. 2008;11(Pt 2):1083-91. [PubMed: 18982712]. [PubMed Central: PMC2782702]. 4. Li C, Huang R, Ding Z, Gatenby JC, Metaxas DN, Gore JC. A level set method for image segmentation in the presence of intensity inhomogeneities with application to MRI. IEEE Trans Image Process. 2011;20(7):2007-16. doi: 10.1109/TIP.2011.2146190. [PubMed: 21518662]. 5. Hunderi AH, Karunakaran N. Segmentation of medical image data using level set methods [dissertation]. Department of Computer and Information Science, Norwegian University of Science and Technology; 2013. 6. Verma N, Muralidhar GS, Bovik AC, Cowperthwaite MC, Markey MK. Model-driven, probabilistic level set based segmentation of magnetic resonance images of the brain. Conf Proc IEEE Eng Med Biol Soc. 2011;2011:2821-4. doi: 10.1109/IEMBS.2011.6090780. [PubMed: 22254928]. 7. Pohl KM, Bouix S, Kikinis R, Grimson WEL. Anatomical guided segmentation with non-stationary tissue class distributions in an expectation-maximization framework. Proc IEEE Int Symp Biomed Imaging. 2004;2004:81-4. doi: 10.1109/ISBI.2004.1398479. [PubMed: 28593029]. [PubMed Central: PMC5459362]. 8. Javeed Hussain S, Venkatesh C, Asif hussain S, Chetana L, Gireesha V. Segmentation of normal and pathological tissues in MRI brain images using dual classifier. International Conference on Advancements in Information Technology Singapore. 2011. 9. Zhao HK, Chan T, Merriman B, Osher S. A variational level set approach to multiphase motion. J Comput Phys. 1996;127(1):179-95. doi: 10.1006/jcph.1996.0167. 10. Madhukumar S, Santhiyakumari N. Evaluation of K-means and fuzzy C-means segmentation on MR images of brain. Egypt J Radiol Nucl Med. 2015;46(2):475-9. doi: 10.1016/j.ejrnm.2015.02.008. 11. Osher S, Sethian JA. Fronts propagating with curvature-dependent speed: Algorithms based on Hamilton-Jacobi formulations. J Comput Phys. 1988;79(1):12-49. doi: 10.1016/0021-9991(88)90002-2. 12. Paragios N, Deriche R. Coupled geodesic active regions for image segmentation: A level set approach. European Conference in Computer Vision, Lecture Notes in Computer Science. Springer; 2003. p. 224-40. 13. Dickie DA, Shenkin SD, Anblagan D, Lee J, Blesa Cabez M, Rodriguez D, et al. Whole brain magnetic resonance image atlases: A systematic review of existing atlases and caveats for use in population imaging. Front Neuroinform. 2017;11:1. doi: 10.3389/fninf.2017.00001. [PubMed: 28154532]. [PubMed Central: PMC5244468]. 14. Sutton D. The whole brain atlas. BMJ. 1999;319(7223):1507. [PubMed: 10582957]. [PubMed Central: PMC1117228].